sagging eyebrows which may give off a tired or sad appearance. frown lines or furrows across the top of the nose. frown lines or furrows between the eyebrows. horizontal creases in the forehead. 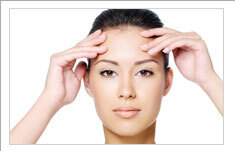 A forehead lift is a great way to achieve a more youthful energetic and rejuvenated appearance. Brow lift is an outpatient procedure that typically takes about an hour. The procedure involves making two incisions behind the hairline (carefully positioning them to ensure they will be hidden within the hair) or one long incision at the hairline, or across the top of the scalp. From here, excess skin is removed and deeper layers are then contoured and tightened, reducing wrinkles and deep lines. Any muscles that cause wrinkling and deep lines can also be weakened to decrease wrinkle formation following the surgery. For patients who do not require a full forehead lift, the lateral brow lift is a less invasive option. A lateral brow lift is performed by making a short incision in each temple area behind the hairline to lift just the tail of the eyebrow and open up the eye area. This procedure is often done in conjunction with a mini facelift. After a brow lift, it is important to keep the head elevated to reduce swelling. Ice packs can be used intermittently to also help reduce swelling. Most swelling and bruising will disappear within two weeks following the procedure. Patients may experience some numbness of the forehead which typically resolves within a few months. Stitches or staples are removed in 7-10 days. Some hair loss may occur near the scar, but usually satisfactory regrowth of hair will occur. Following a brow lift, the majority of patients are very happy with their results. A brow lift can restore a more youthful appearance, making a person look less tired and more energetic. A brow lift does offer long-term results; however, as the face continues to age, additional touch up procedures may be needed. On average, the cost for brow lift ranges from $2,500-$5,000.